We’ve had an unusual winter, with warmth and drought over the western U.S. and record-breaking cold and snow over the Northeast. For over a year, the weather pattern was locked up with high pressure over the West Coast and low pressure over the eastern U.S. We are now close enough to summer to get a clearer view of what might be in store. Let me tell you about it, so you can plan outdoor trips accordingly. The most powerful tool that U.S. meteorologists can use to forecast months or seasons ahead is called the Climate Forecast System (CFS), run by the National Weather Service. Its prediction for surface air temperature for June through August (see image below) indicates warmer-than-normal temperatures over the western U.S. This warmth will increase the danger of wildfires over the Sierra Nevada, the Cascades, and the mountains of British Columbia. The opposite is true of the High Plains and Colorado, with below-normal temperatures predicted from Texas to the Dakotas. Surface air temperatures forecast by the National Weather Service Climate Forecast System for June through August. Red shows above-normal temps (°C), and blue below-normal temps. What about precipitation? Rainfall will generally be normal along the West Coast, but the Rockies and High Plains will be substantially wetter than normal this summer. Most of this precipitation will be due to thunderstorms, which also bring lightning. 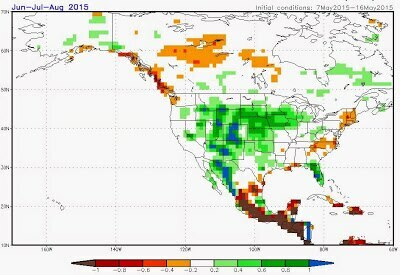 Precipitation predicted by the same modeling system; green and blue areas will be wetter than normal; orange and red, drier than normal (units are in mm). Because lightning is a major cause of wildfires, and with warmer-than-normal conditions drying the land, the potential for summer wildfires is significantly increased. Lightning is also a danger in high terrain, so it’s a good idea to get an early start to hikes and climbs, and get off peaks and crests by early afternoon, when thunderstorms tend to be most frequent. If cumulus clouds are developing rapidly around you when you’re ascending a ridge, you should descend as quickly as possible to minimize your risk. 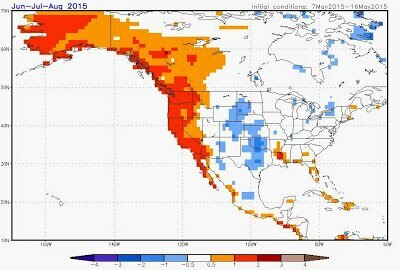 So, if you plan on hiking along the West Coast this summer, be ready for sun and heat. And, be careful with fire. In contrast, an excursion in the Rockies might require some rain gear and a watchful eye for thunderstorms. Enjoy. Cliff Mass is a professor of atmospheric sciences at the University of Washington. He is a fellow of the American Meteorological Society and has been an editor of several meteorological journals. 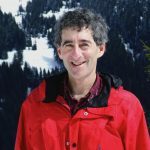 He is the author of the 2008 book “The Weather of the Pacific Northwest” and broadcasts a weekly weather information segment on KPLU, a local public radio station. He regularly writes commentary on weather at on his blog. REI member since 1977.